AMD FirePro™ W600 professional graphics is the ideal solution for powering display walls designed to attract, inform and engage audiences or foster collaborative interaction and decision making. It’s the powerful, flexible and affordable multi-display professional graphics product the display wall market needs.Delivering the performance, high display density and dedicated features needed to configure multimedia rich display walls. 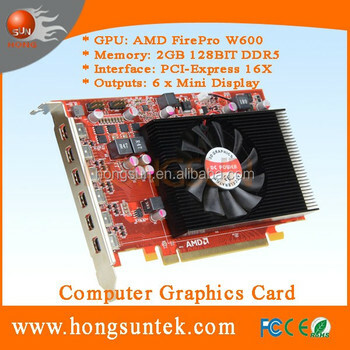 AMD FirePro™ W600 professional graphics is the most powerful solution available for configuring display walls featuring multiple displays – no other single-slot professional graphics card is capable of driving up to six displays (with independent audio streams), features the latest graphics memory technology for exceptional multimedia performance and only consumes 75W maximum power.Six Mini DisplayPort outputs for driving six displays or projectors.